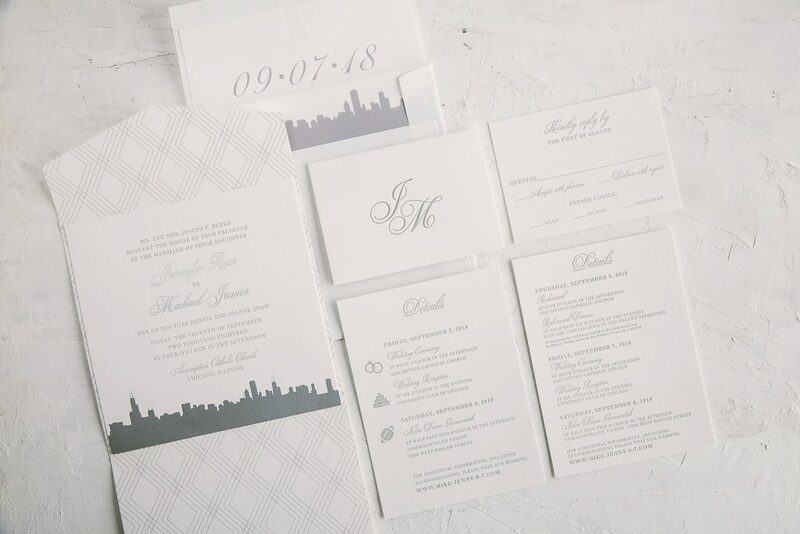 Nishat and Stephen worked with our friends at Urbanic Paper Boutique to customize our Shale design for their recent California wedding. 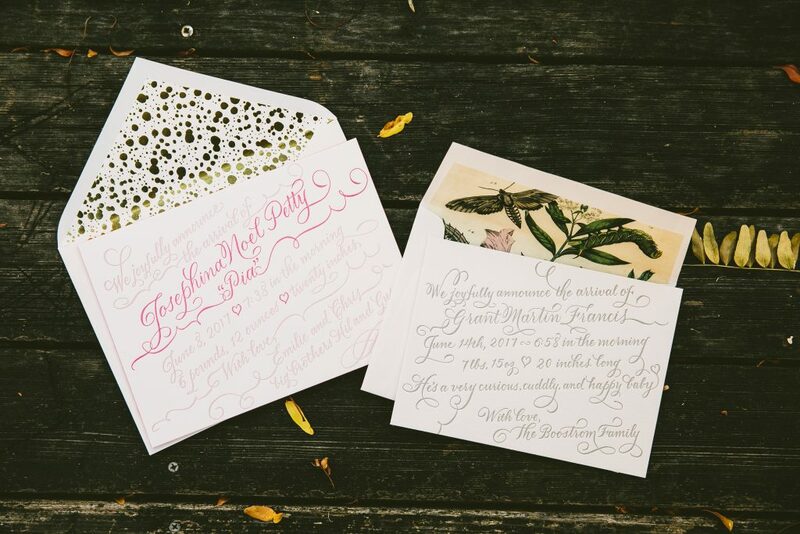 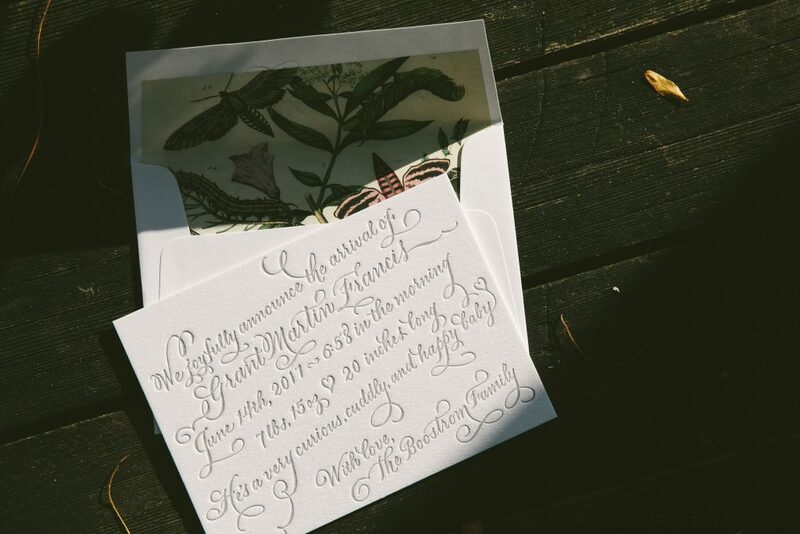 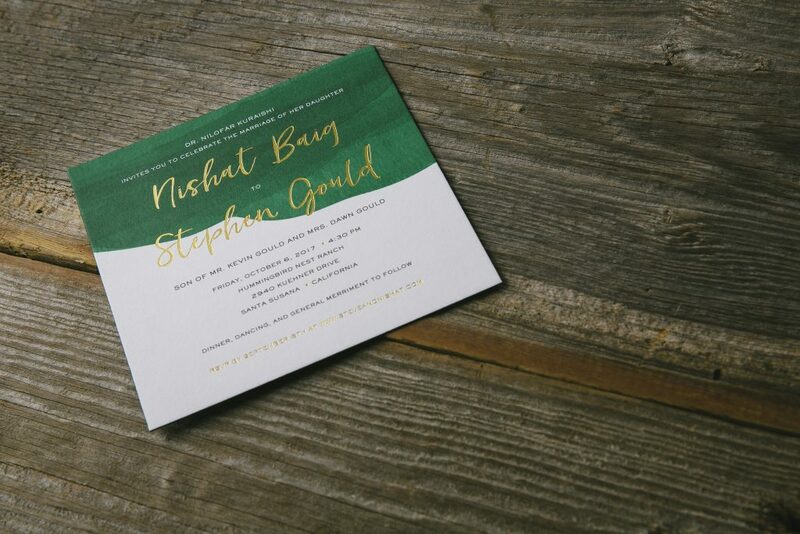 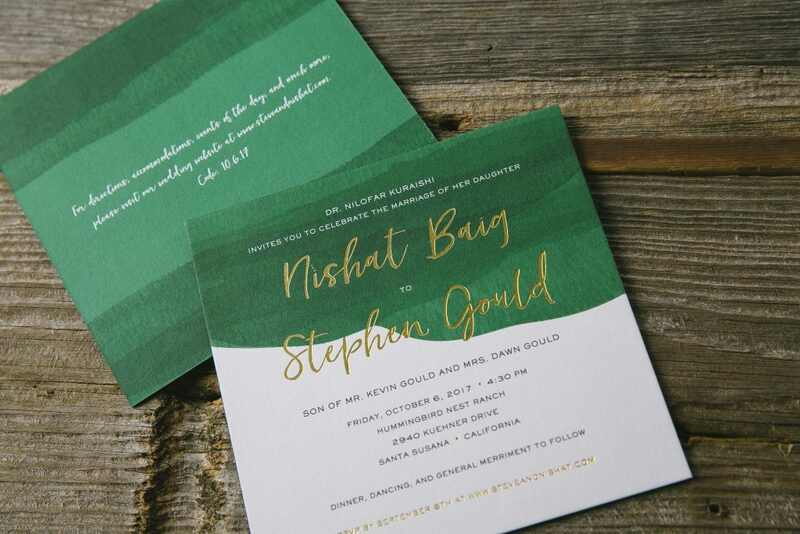 Their jewel-toned watercolor wedding invitations featured modern touches like a website for guests to reply and to reference wedding weekend specifics. 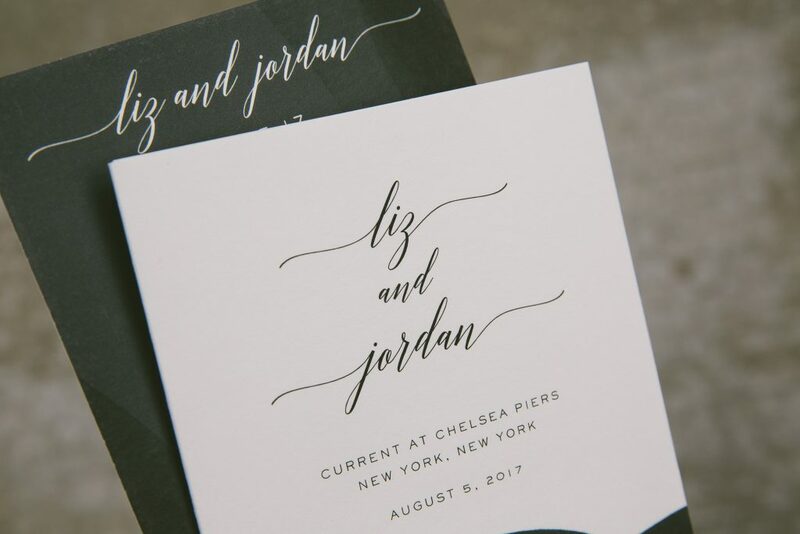 Liz and Jordan worked with us at our flagship store in Manhattan for their wedding invitations and for their day-of stationery pieces, all based on our Shale design. 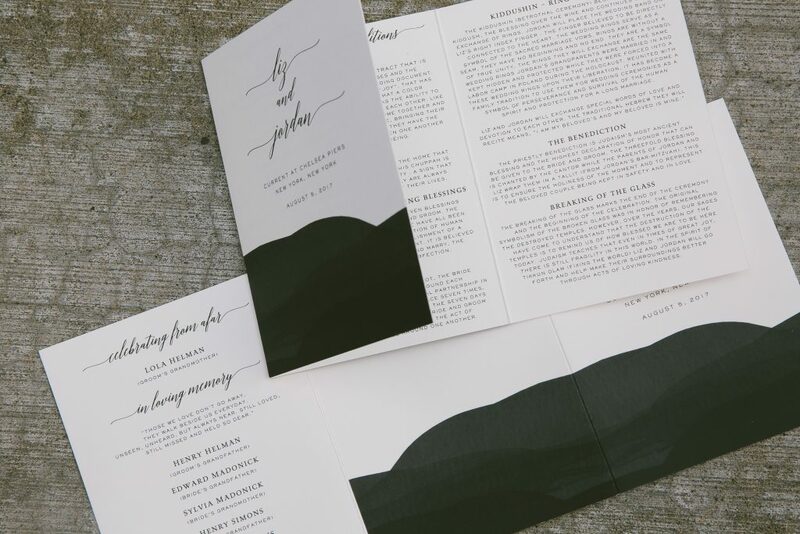 The abstract watercolor artwork added a dramatic vibe to the menu and trifold program, which served as a guide to the ceremony traditions. 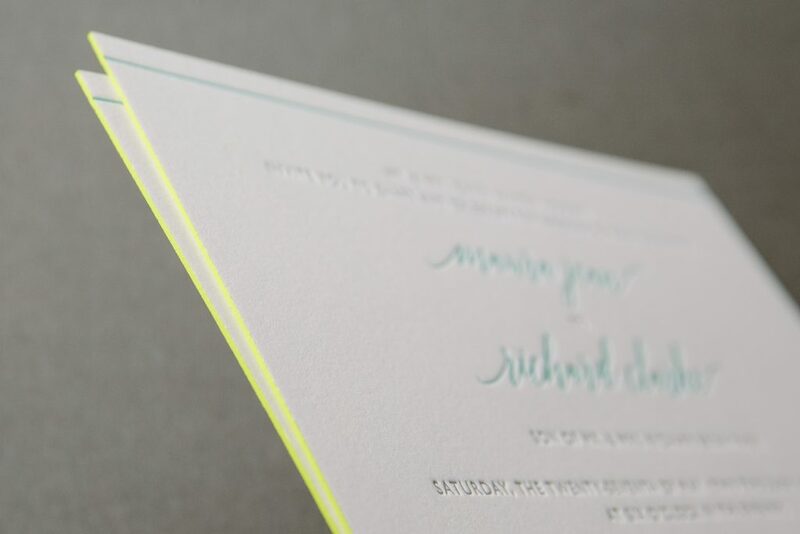 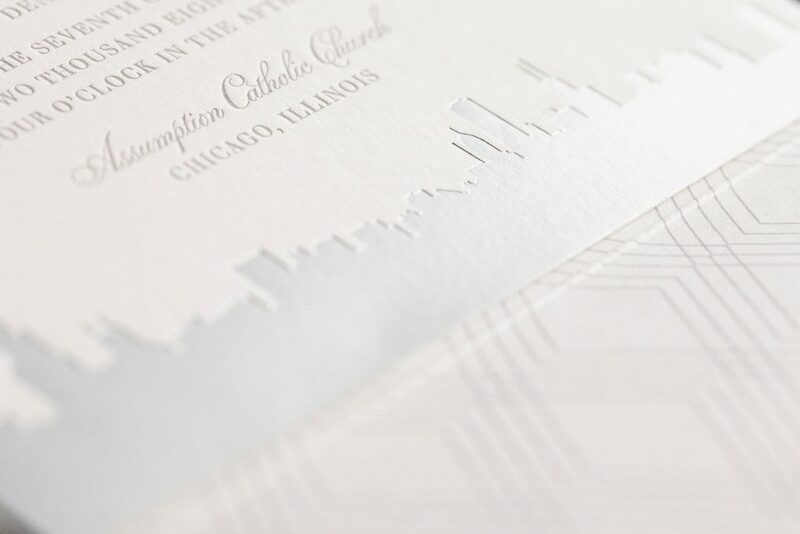 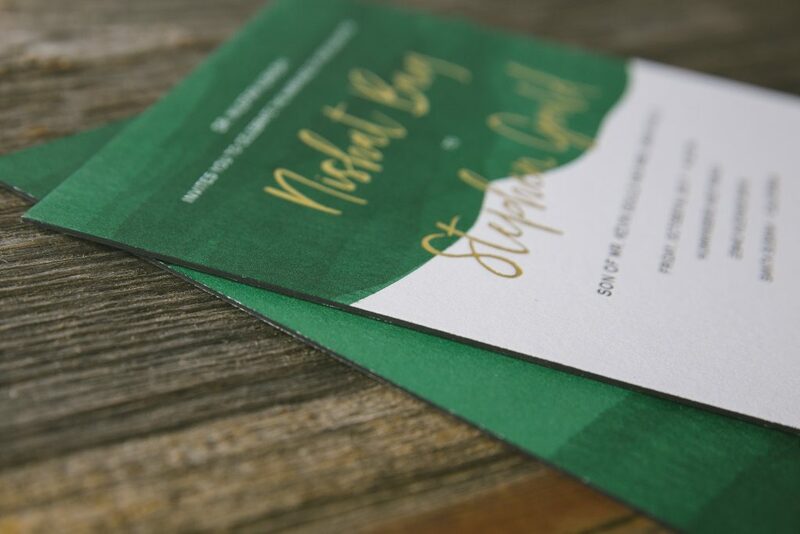 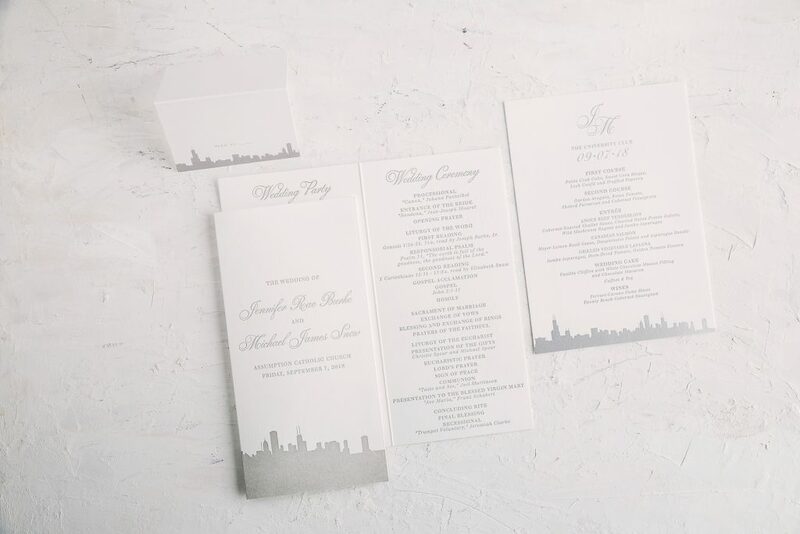 Our friends at Big City Bride helped Maura and Richard create these bold and bright letterpress wedding invitations using our Simple Elegance design as inspiration. 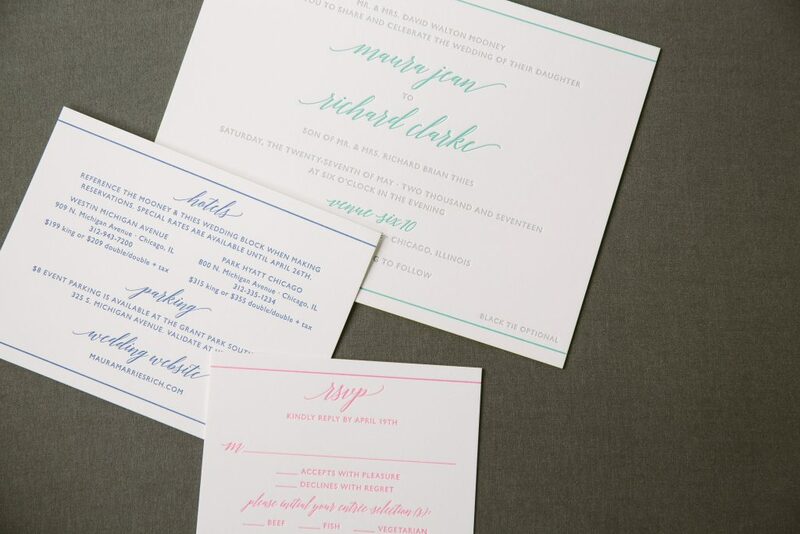 They opted for a less formal horizontal layout and used a colorful palette of shale, aquamarine, neon pink and cobalt letterpress inks. 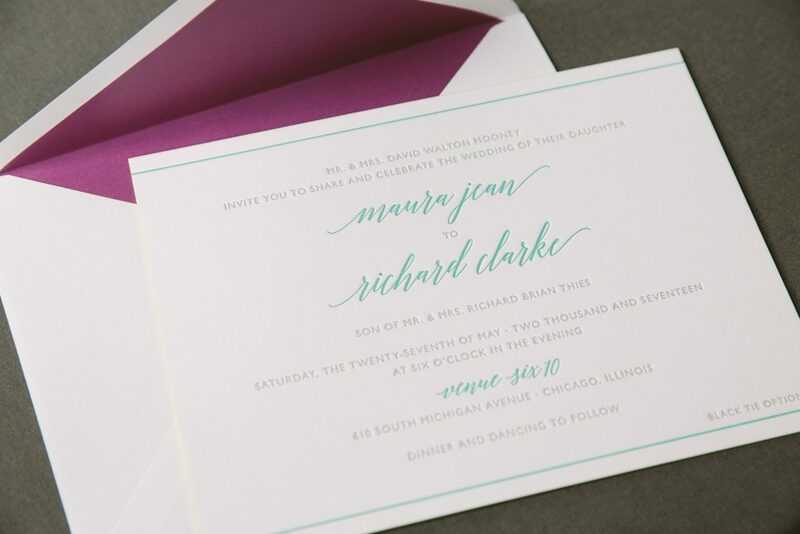 For even more color they added lime-aid edge painting and an aubergine envelope liner. 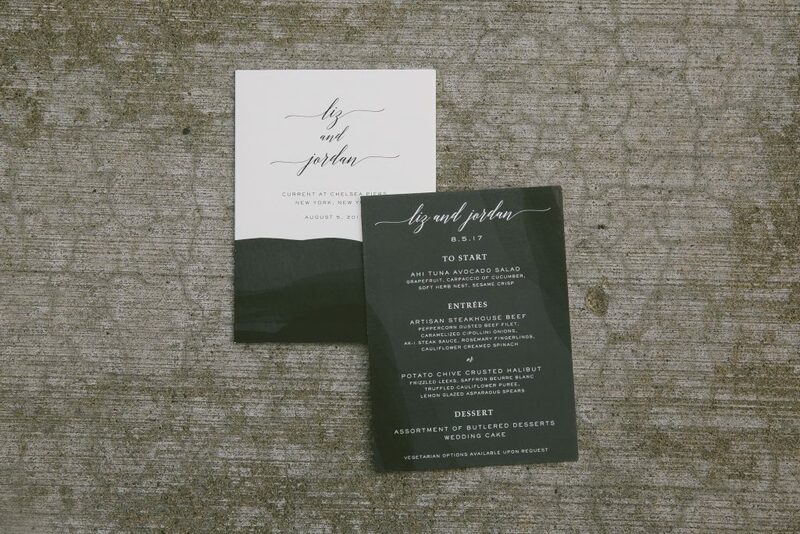 The overall look highlighted the contemporary, stylish vibe of their Chicago venue. 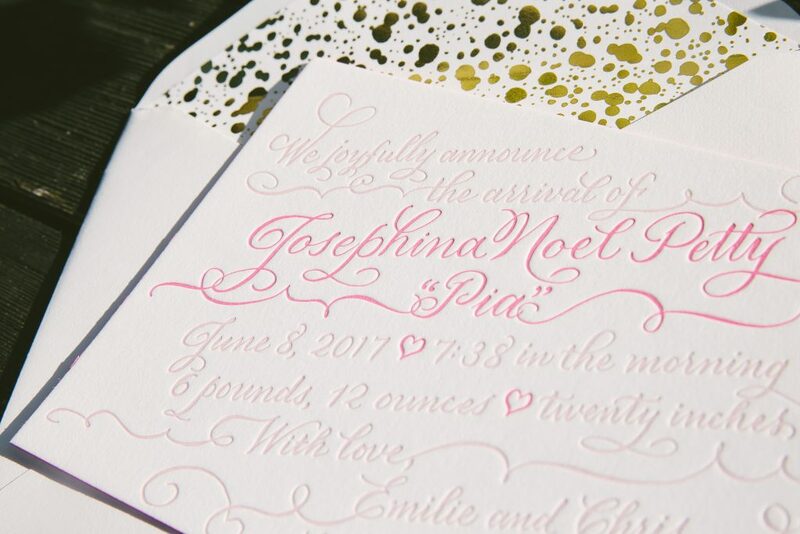 Our New Calligraphy design has been a perennial favorite for parents looking to announce their new additions in a stylishly sweet way, and these two letterpress baby announcements show why this design is so versatile. 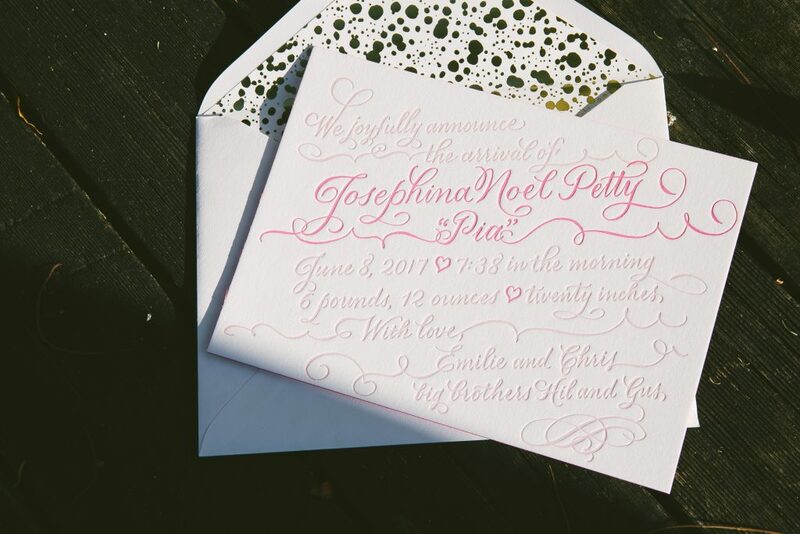 Pia’s family chose a girly combination of cherry blossom and neon pink letterpress inks and added shine with a gold foil envelope liner. 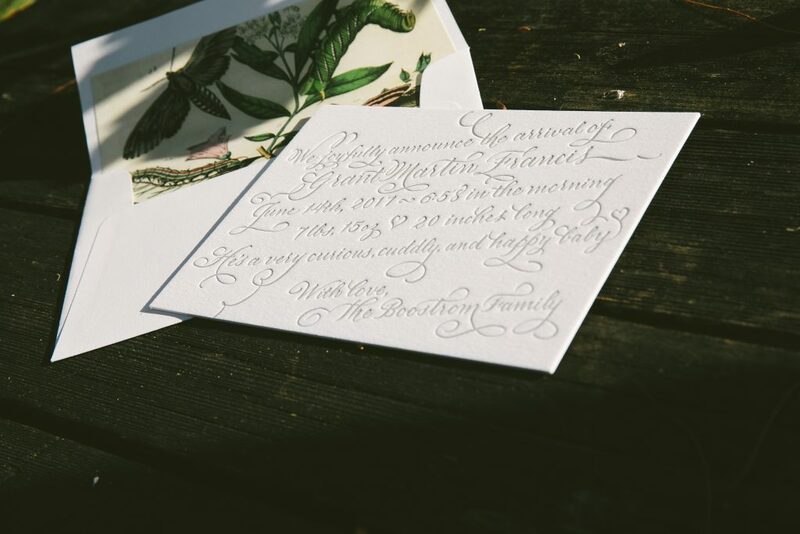 For baby Grant, our subtle shale letterpress ink was paired with our Natura liner pattern for an earthy, botanic inspired announcement. 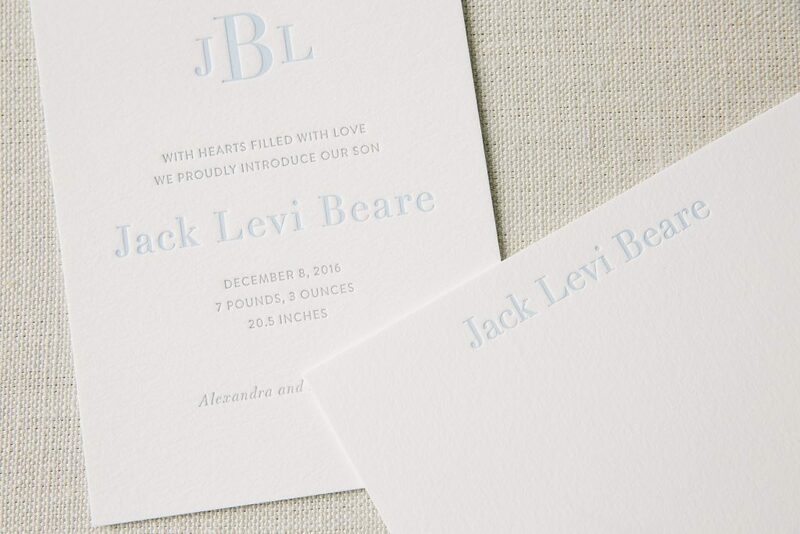 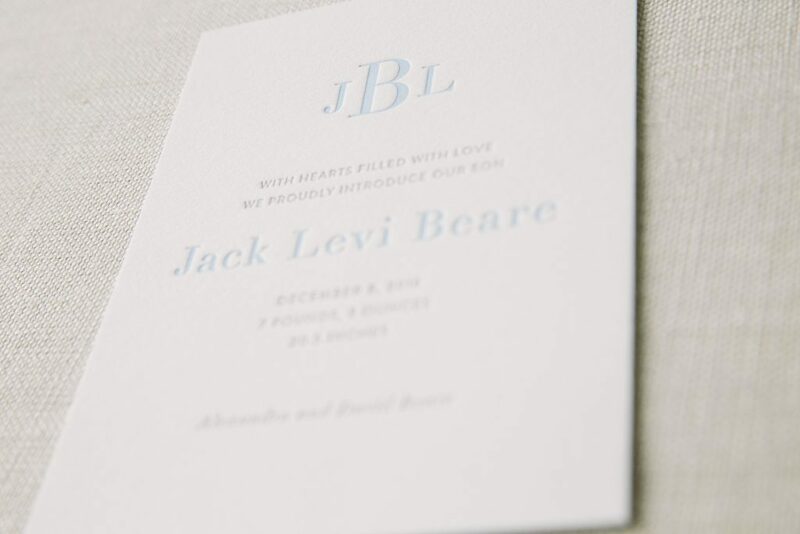 To announce the arrival of baby Jack, proud parents Alexandra and David worked with the team at our flagship store in Manhattan to create these monogram letterpress birth announcements and social stationery. 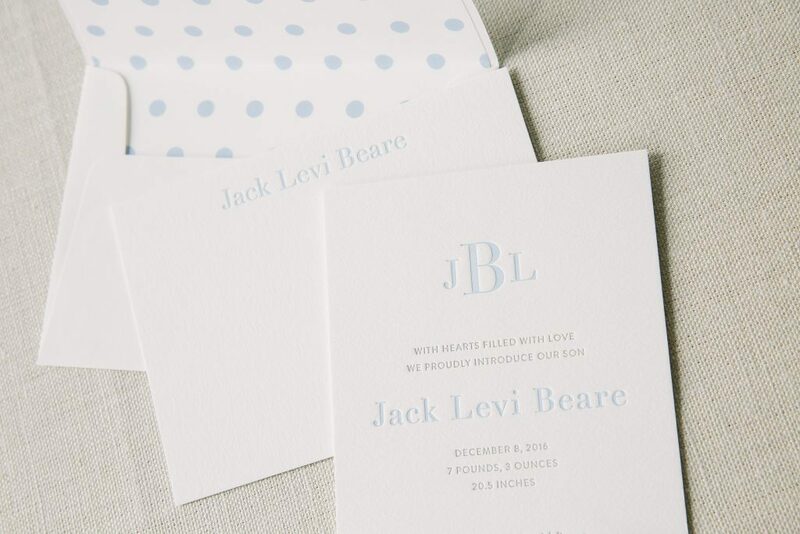 A palette of french blue and shale letterpress inks was accented by a sweet polka dot envelope liner for a cute but classic look.